It's Lovely! I'll Take It! : Korch? Katio? Keck? Maybe it's because I live in a rainforest, but this makes no sense to me. I've never been to Texas. Is this, like the outdoor washers and dryers in Southern California, totally normal? You guys are all, "Four walls? Hell, no!" 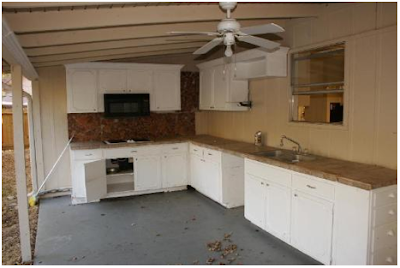 and just have your kitchens hanging out in the back yard? It's an outdoor kitchen for hosting parties. Although usually when you say something has an "outdoor kitchen" you mean it has a grill, some counter space, a sink, and maybe a fridge. 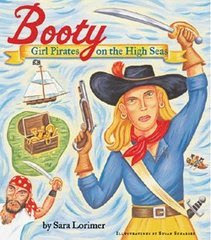 Usually it's not taken quite so... literally. I think the outdoor kitchen is so that you can simultaneously cook and keep your eye on the kids trapped in the child run...um safety enclosure....um, kiddie kennel in the back yard. I love the "just sweep the mess outside" cleanup feature of this kitchen. At least it is an outdoor kitchen and not an outdoor bathroom! To answer your more direct question. No. In Texas we do not cook outside, unless we're masochists. We do not have a particularly inviting climate for doing so. No, you missed the point: it's the Passover kitchen! It's either so that baby wildlife can bake snacks with their moms at the weekend. It's the strangest, wrongest interpretation of Kashering I've ever seen. As others have said its called a summer kitchen, very popular many years ago when all the rage was to get a pool. Then you could throw pool parties and cook etc... When I had to run the office a few years back b/c my boss was building his million dollar monstrosity I learned that the summer kitchen was a "must have" along with elevators/wine closets. Although this really looks like someone was try to expand on the house and add a bigger kitchen and forgot to add walls and get rid of the smaller one? Thank you, C! That makes this listing truly complete because it *does* have a pool...er, a pool frame, er, okay bring your own liner but it's a technicality! See the last photo in the listing. Wowsa; skeery. With the amount of counterspace there, I'd suspect that it might have been a canning kitchen in particular. It's not unusual here in the northeast US to have a second kitchen for canning and freezing fruits and vegetables in the summer. The climate would prohibit it being outside, but I suppose if I lived where it were warmer, it'd be nice to do that. I thought perhaps there was a clearance in the kitchen department at Lowe's, and the owner got a really great deal. guess you'll never have to bother to 'open a window' whilst cooking! I think "keck" is a fitting name for cooking in the heat like that. It would make me want to "keck" too. As pointed out you don't need to open a window. Sorry, Sue -- I'll admit that the accordion was just a prop, and I didn't notice the keys. Well, the parts of Texas I lived in you'd only get to use the outdoor kitchen maybe twice a year - once in February and once in October - other than that it'd be too hot or too full of fire ants. With that kind of woodworking, wouldn't you want some kind of door or tarp or something to close it off when it rains, and keep dust out when you're not using it? Ok, so that might just be plastic laminated particleboard, but it still doesn't want to be wet, and I still don't want whatever I keep in the cupboards all covered with dirt and bugs. I used to live in an apartment in Houston that had the washer and dryer outside in a... shed? 3 walls, no front wall, and the mailboxes were in there too. It rains a lot in Houston so you'd have to keep it covered, but at least it's usually warm enough. Pipe-freezing cold is rare. I think it rains less in San Antonio, though. Oh, and the "pool" shown in the other photo? That's actually a trampoline - apparently for kids who can't jump. Here's what I think: the owners were renovating the kitchen and parked the new stuff outside until they could demo the indoor kitchen. 'Cause that indoor kitch looks like crap to me, cramped and with no counter space. Or maybe Mommy just likes to cook outside on Opposite Day. 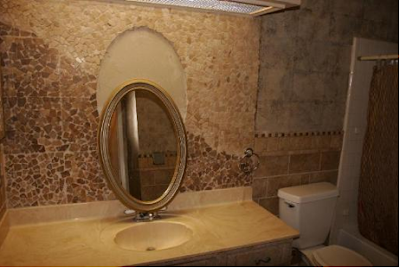 Note to realtor: glue mirror back on wall before taking picture. In Austin, that would be one heck of a hot, humid kichorch, but I think it's really a sophisticated trap for household pests. Any ant, roach, or mouse will be cleverly confused to find themselves hiding in a cabinet, but still outside ! I believe the correct term is "portchen." I dye yarn. That wouldn't be a terrible setup. Not great, but not terrible. We also have outdoor laundry "rooms" in Florida. It's most unpleasant, especially in the summer when it's 100 degrees, 100 percent humidity, and lightening and raining buckets every afternoon. My coonass ex had an outdoorish kitchen sorta like that, in which he fried fish, boiled crawfish, and made sausage, because doing that stuff inside is gross and/or stinks up the house. This was in New Orleans, where people do a lot of big cooking for big groups of people. Okay, I live in Texas, and that ain't no outdoor kitchen. That's a regular "normal house" kitchen where someone just randomly (and most likely, drunkenly) decided to knock down a wall. True outdoor kitchens are very popular here, but are much nicer and look obviously intended for the outdoors with exterior-grade appliances, usually a grill, etc.